"This is a delicious lighter cream pie for which the filling is cooked prior to being put in the baked shell. Real butter and half and half are must-haves for this to be at its best. People always ask for the recipe." Mix cornstarch and sugar. Add 4 tablespoons butter and half and half. Cook over medium heat, stirring constantly, until mixture boils and becomes thick and creamy. Remove from heat and stir in the vanilla. Preheat oven broiler to high. Pour mixture into pie crust. Drizzle 2 tablespoons butter over top and sprinkle with cinnamon. Put under broiler until butter bubbles--watch it carefully as it doesn't take long. Refrigerate for at least 1 hour before serving. Again another Hoosier here. 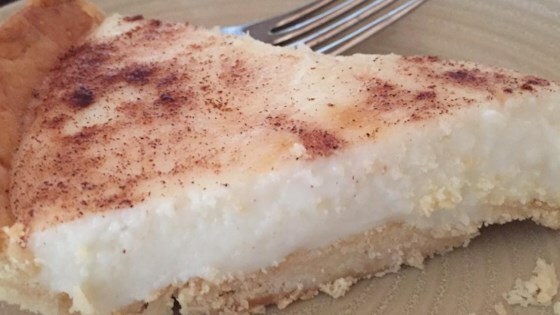 I loved my grandmother's sugar cream pie and never could find a recipe close to hers till now. Thanks even my New Yorker husband loved it.